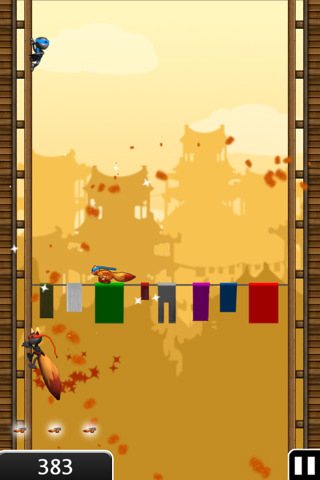 Backflip Studios (Paper Toss and Ragdoll Blaster) has done it again and created a amazing free game called Ninjump. This is a survival action game in which you run up against 2 sides of a building, achieving power-ups while dodging and avoiding obstacles. Ninjump takes a different approach for obtaining power-ups or bonuses. Instead of just coming across them, you have to actually achieve them. What I mean is that there are 3 things that are bent on making you fall to your death, Birds, Squirrels, and other Ninjas. While jumping from one side to another, if you are able to kill or hit 3 of those things in a row then you are given a power up. These power-ups allow you to transform into 4 forms of super ninjas (are there anymore? My max score was only 6814). Another bonus is a bubble, which essentially gives you an extra life. This bubble forms this circular blue aura around you protecting you against the forces of nature. These are placed randomly in the map, so good luck getting them! The graphics in this game are superb! When achieving a power-up, the animations are explosive as you fly or jump up the side of the building. The 3D moving background, effects and sound are well designed and makes me wonder how I could get such a great app for the price of nothing!